In a world where 80% of the population has a superpower called a “quirk”, heroes and villains battle it out on a regular basis. This is the story of how one quirkless boy will earn the power to change his destiny and become the greatest hero of all in this adaption of the hit Shonen Jump manga. Ever since he was little, Izuku Midoriya has desperately wanted to attend the prestigious U.A. High and become a hero but he has one big problem: he is one of the 20% of people who were born without a superpowered “quirk”. Izuku was beaten down and ready to give up this dream until a chance encounter with All Might, the greatest hero of all gives him the chance to challenge his fate. However, Izuku must learn to control his newfound powers if he will have any hope of getting in to U.A. High. Izuku has survived the fitness testing by learning to control One-For-All, but that’s only his first day at U.A. High! Next up on the agenda is Battle Simulation, and the preparation for this takes up the bulk of this episode as the class excitedly learns of the details for the simulation. Amusingly, the scenario is a little bit like cops and robbers, with the class divided up into opposing pairs – one pair playing the heroes tasked with infiltrating a hideout to disarm a bomb, and the other pair playing the defending villains. Quite happily for us as viewers, Izuku finds himself paired up with his budding friend Ochaco, but the elation is short-lived when he finds out that his opponent is Bakugo. One thing that I continue to appreciate is how well the extended cast of this show has been characterized in such a short time, and this made the various match-ups immediately interesting because of the knowledge we have of the personalities and quirks in play. The rest of the episode follows the beginning of Izuku’s battle simulation, and I really enjoyed this segment for a number of reasons. The animosity between Izuku and Bakugo has been strongly established so far in the series, and I’d say that early on it appears that Bakugo’s disdain for Izuku stems from the heroism that Izuku manages to display in the face of adversity even without a Quirk. We saw in the previous episode the frustration that Bakugo now feels with Izuku having an unexpectedly powerful quirk, and this undercurrent works really well in the episode to set up the emotional stakes for this battle starkly. The battle itself capitalized really well upon this emotional context immediately as Izuku dodges a punch and takes down Bakugo. This was powerful precisely because of the emotional context – we know immediately how damaging this is to Bakugo’s pride, but even more importantly this continues Izuku’s character development meaningfully. It feels like in each episode we get a really enjoyable character moment from Izuku to chew on, and this episode linked in well to show his increasing determination in an endearing fashion. It also bears mentioning that the scene was really well directed, with the animation highlighting to explosion in tandem with the rising swell of this series now familiar heroic theme. My Hero Academia continues to be a series that knows how to emphasize the way small moments affect mindsets of each of these characters on their paths, and I’m really excited to see the conclusion of this battle in the next episode. In one line: Grand slam by Deku! It’s Izuku’s first day of school at U.A. High, and he’s got some work to do as his class immediately begins with physical testing. This isn’t your usual fitness testing though, because all of the students are allowed to use their quirks in the tests such as long-jump, ball-throw, and others. I enjoyed this quite a lot, and it ended up being a funny and creative way to introduce the wacky cast of characters Izuku’s class is comprised of. I continue to be impressed at the creativity of all of the quirks in the class, and it was really cool to see them used in interesting ways in something as mundane as a fitness test. We also get a great sense of the different personalities in play from the way each approaches the fitness test - the explosive way that Bakugo approaches the fitness tests feels perfectly in line with his character, and the rest of the quirks on display are similar in this regard. One thing I’ve enjoyed about this series so far is the humour that is incorporated into all of the proceedings. There’s a pervasive sense of fun and wonder throughout that feels appropriate, and it never feels like the series is taking itself too seriously. This episode is an excellent example of this, and as I mentioned before I really liked the way that comedic relief was interwoven into the character introductions. I laughed quite a bit at Ochaco’s success in taking away the ball’s gravity to achieve a score of “infinite” in the ball throw, and at Mineta’s use of his hair to destroy the side-stepping test. There’s a wonderful sense of whimsy to this show, and I’m really liking the balance struck between the more serious emotions felt by Izuku and the general wonder of being a hero. Although this episode was relatively lighthearted, I enjoyed the way that the fitness testing also functioned as a catalyst for Izuku’s character development. His progression continues to be handled very well in the sense that we see very clearly his struggle to master his new powers in the fitness testing. This tangible sense of his effort made it even more satisfying when he inevitably triumphed at the end of the episode, and it never feels like he is unfairly overpowered. It’ll be interesting to see what challenge is thrown his way next, and I’m very much looking forward to his continued progression. In one line: Lots of creativity to be seen in the way the characters’ powers are introduced! With an untested quirk in tow, Izuku enters U.A. High’s entrance examination to put his skills to the test along with hundreds of other young hopefuls. This episode spends its entire duration following Izuku from the beginning of the examination up until his eventual acceptance. This was another strong episode, and it brought a close to this series’ first arc effectively by bringing together the themes of heroism and determination that were emphasized so clearly in the previous episodes. Again, the pacing felt perfectly natural and suited the emotional highs and lows of this episode appropriately in giving Izuku’s story the weight it deserved. The examination was extremely well-portrayed, absolutely nailing the dramatic aspects of Izuku’s experience there. He struggles early on to get any points by destroying the villain targets in the city, and the odds are laid out fairly clearly by the other students as they dismiss him with laughter. Near the end of the test, a massive robot appears and sends the others running, and this is where things get really, really good. Izuku sees that Ochako is trapped under rubble and springs into action without thinking to try and save her. As some incredible music plays in the background, Izuku’s powers activate for the first time as he flies up and completely smashes the robot. Although he shatters all the bones in his body, this bit of heroism proves to be the ticket as he gets into U.A. High the next week. This scene was just plain awesome, with the aforementioned music and some create dialogue coming together to give Izuku’s sort of awakening a truly epic feel. The rest of the episode was solid and focused on the fallout from the entrance examination. The animation continues to be great, with the action scenes well animated, and the music (oh man, the music) bringing out the emotions in each scene in a satisfying way. Although My Hero Academia showed in this episode that it is still sticking firmly to the shonen playbook, it was nice to see Izuku’s heroism rewarded so clearly. This series continues to have such a palpable sense of earnestness and heart that make all the cliche moments feel genuinely satisfying to witness, and I’m looking forward to seeing how Izuku’s new school life begins. In one line: Izuku channels his inner Saitama in this episode, great stuff. Izuku may be able to become a hero now, but he’ll have to take care of getting a quirk first. As it turns out, All-Might is there to help, and asks Izuku if he is willing to take on the responsibility of having All-Might’s quirk “One for All” passed along to him. Naturally, Izuku can’t inherit this quirk just yet in his weak state, and the rest of the episode follows him as he spends the next 10 months training for the U.A. High entrance exams. I probably would have worried about the pacing if I’d been told that this series would only be through roughly 2 and a half chapters the manga in 3 episodes of air-time, but the pacing is just fine here. I was impressed that the episode never seemed to drag, and it was cool to really see Izuku’s determination as he trained ceaselessly to become capable of All-Might’s power. This all culminated rather nicely in a satisfying roar from Izuku, and I thought this was well earned. Izuku heads to the entrance exam after ingesting one of All-Might’s hairs to receive his powers, and immediately prepares to eat pavement after tripping on his first step into the campus. However, Izuku is frozen in mid-air by the charming Ochako Uraraka, who saves him from falling using her quirk. Such cheerfulness! It was also pretty great that Izuku seemingly has no problem running into a villain’s grasp to save his friend but is completely freaked out at the thought of talking to a girl, and even better was his self-congratulations on talking to her without noticing he hadn’t said a word. This scene made me laugh, and was a great introduction to Ochako as a character. After his thrilling experience kind of/sort of/not really/not actually talking to a girl for the first time, Izuku finally makes it inside to U.A. High’s auditorium for a briefing on the entrance examination. This ends up being a set-up for the next episode, but it’ll be interesting to see what the examination will have in store for Izuku with no time to test out the powers he’s supposedly inherited. In summary, this was a fun transitional episode, and I enjoyed that it took the time to make sure that Izuku’s inheritance of All-Might’s power is firmly grounded in his own effort. This continued the emphasis this series has put so far on heart and perseverance being the hallmarks of a true hero, and I’ll be interested to see this put to the test in the examinations. In one line: Ochako Uraraka is on the scene! So we are back at it again immediately after the events of the first episode, with Izuku on the rooftop with All-Might desperately asking if he can be a hero too. Naturally All-Might’s final answer is saved until the end of the episode, but this is another very good episode which showcases this series’ best themes. It turns out that the slime villain All-Might bottled up in the first episode is on the loose again, but this time the villain has tried to swallow Izuku’s tormentor/childhood friend Katsuki Bakugo up in the middle of the city. I really enjoyed watching this scene come to life, and I really enjoyed seeing all the heroes in motion using their various powers. Naturally, Izuku hears about the villain attack and heads straight there to discover Bakugo’s predicament, becoming wracked with guilt over his realization that the villain getting loose was likely his fault. This leads to a wonderful sequence which functions as the climax of this episode as Izuku confronts his fears to run forward to help even though the more established heroes on the scene have more or less left Bakugo hanging until a suitable hero arrives. My Hero Academia fully buys into the optimistic superhero ideals you might find in a comic such as Superman, and this fits into Jump’s whole “Friendship, Effort, Victory!” mantra extremely well here as the episode ends with All-Might firmly telling Izuku that he can be a hero despite having no quirks. I liked how the show wasn’t afraid to show All-Might being affected by Izuku’s actions, giving the episode a solid thematic coherence bookended by Izuku’s plea to lead off the episode, and All-Might’s answer at the end. One thing that I loved in particular about this episode is that the music is absolutely on-point. This comes through in a big way during the climax of the episode when Izuku rushes forward to save Bakugo, and I was on the edge of my seat the entire time because of this. There’s something to be said about the way great music properly timed to the emotional peaks and valleys of a scene can take it to another level in terms of immersiveness, and My Hero Academia does exactly that in this episode. In one line: A very good second episode with some great thematic cohesion. I’ve been eagerly awaiting My Hero Academia’s arrival in anime form after following the manga as it’s been released in English, and to my delight I was not disappointed one bit by this episode. The story is simple - Izuku Midoriya dreamed of being a superhero like his idol All-Might, the strongest hero of them all. However, Izuku is one of the rare children born without a superpower, or Quirk, of his own, preventing him from realizing his dream and getting into the prestigious hero academy U.A. High. When a fateful encounter with his hero changes everything, Izuku finds himself on a path he never dreamed would have been possible. This might all sound cliche, but what My Hero Academia has such a strong sense of earnestness and heart that has made it one of the most enjoyable manga series on the market today. Thankfully, the first episode perfectly captures this heart in telling Izuku’s “origin story”. I enjoyed how quickly we got to see what makes Izuku tick and what drives him forward to become a hero in spite of his lack of natural ability. This is placed in enjoyable context as well because the show gives us a very clear sense of his emotions at being left behind in a world that has come to more or less revolve around these new heroes. This comes through first in his interactions with his middle-school classmates, then in his struggle against fiery bully Bakugo, and eventually in meeting All-Might. While there isn’t anything groundbreaking here in terms of his character, I enjoyed that the episode took the time to explore Izuku’s character a little bit to provide a foundation for the series, and I enjoyed this episode very much. I was happy to see that this episode perfectly captures the cartoony feel of Izuku’s superpowered world, using a brightly coloured palette to create a hopeful and optimistic feel. The influence of American superhero comics is also lovingly incorporated into a number of facets of the show’s artistic design, with large “BOOOM” graphics appearing, as well as Ben-Day dots for character splash-images as they are introduced. The show is also fluidly animated, and while we don’t get to see too many drawn out action scenes in this episode I was thoroughly pleased with the quality of animation. The OP and ED are both great, and are among my favourites of the season so far. The bottom-line is that if you’re an anime fan with a fondness for American superhero comics, this is the show you need to be watching. In one line: This is an excellent first episode, and sets up Izuku’s coming-of-age story extremely well. My Hero Academia is produced by Studio Bones and is airing during the Spring 2016 anime season. Directed by Kenji Nagasaki (Classroom Crisis), the series is an adaption of Kohei Horikoshi’s hit manga running in Shueisha’s Weekly Shonen Jump magazine. The series will run for one cour, totaling 13 episodes. 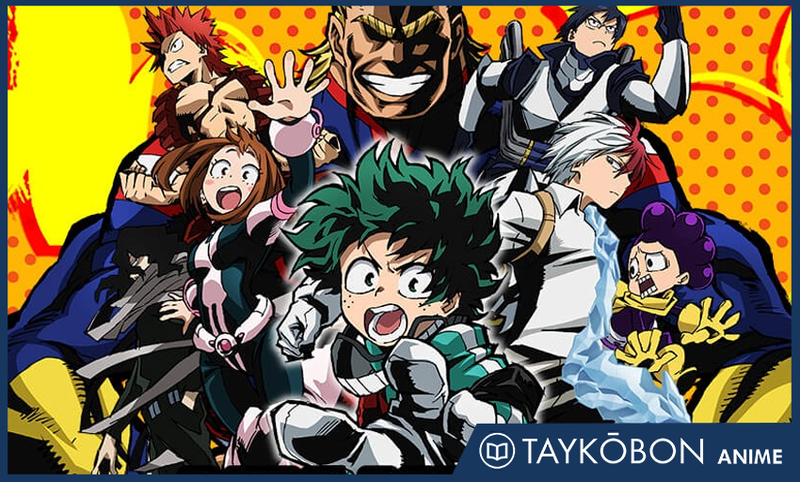 You can stream My Hero Academia on Funimation.